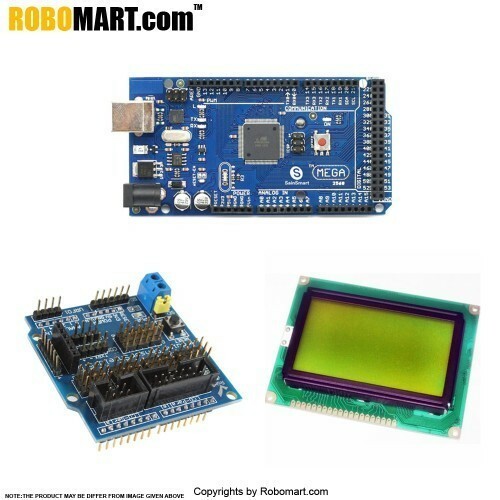 This is a new Robomart Mega2560 R3 kit, which is easy for Arduino fans and starters to plug and play, containing one Robomart Mega2560 R3, one Robomart IIC LCD2004, one Robomart Sensor Shield V5. *1.0 pinout: added SDA and SCL pins that are near to the AREF pin and two other new pins placed near to the RESET pin, the IOREF that allow the shields to adapt to the voltage provided from the board. In future, shields will be compatible both with the board that use the AVR, which operate with 5V and with the Arduino Due that operate with 3.3V. The second one is a not connected pin, that is reserved for future purposes. Robomart Sensor Shield V5 (new version) has the COM and I2C (IIC) ports separated, so that both ports can be utilized at the same time to increase the possibilities of use. Arduino Sensor Shield allows you to connect to various modules like sensors, servos, relays, buttons, potentiometers and so on.Just plug & play. Each functional module has buckled port with VCC, GND and Output, which has corresponding port on the Sensor Shield, connected with a plain 2.54mm dual-female cable you may start playing already. LCD module based on the popular HD44780 controller.